Gun Control in the Third Reich: Disarming the Jews and "Enemies of the State"
Based on newly-discovered, secret documents from German archives, diaries and newspapers of the time, Gun Control in the Third Reich presents the definitive, yet hidden history of how the Nazi regime made use of gun control to disarm and repress its enemies and consolidate power. The countless books on the Third Reich and the Holocaust fail even to mention the laws restricting firearms ownership, which rendered political opponents and Jews defenseless. A skeptic could surmise that a better-armed populace might have made no difference, but the National Socialist regime certainly did not think so—it ruthlessly suppressed firearm ownership by disfavored groups. 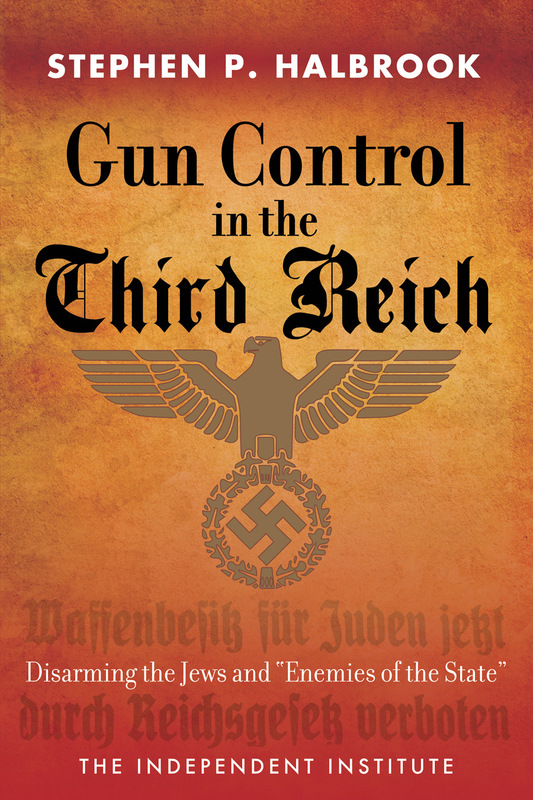 Order Your Copy of Gun Control in the Third Reich TODAY! STEPHEN P. HALBROOK is a Research Fellow with the Independent Institute who has argued and won three constitutional law cases before the U.S. Supreme Court. Dr. Halbrook is the author of eight books including The Founders’ Second Amendment: Origins of the Right to Bear Arms; Securing Civil Rights: Freedmen, the Fourteenth Amendment, and the Right To Bear Arms; That Every Man Be Armed: The Evolution of a Constitutional Right; A Right to Bear Arms: State and Federal Bills of Rights and Constitutional Guarantees; Target Switzerland (also in German, French, Italian, and Polish editions); and The Swiss and the Nazis: How the Alpine Republic Survived in the Shadow of the Third Reich. He holds a Ph.D. in philosophy from Florida State University and J.D. from Georgetown University Law Center. His popular articles have appeared in the Wall Street Journal, San Antonio Express-News, Environmental Forum, USA Today, and Washington Times, and he has appeared on numerous national TV/radio programs such as “The Phil Donahue Show” and programs on Fox Business Network, Court TV, Voice of America, CNN, and C-SPAN. A year before Adolf Hitler took power in 1933, the German Interior Minister directed that gun registration records be made secure to keep them from falling “into the hands of radical elements.” His efforts proved futile: the records fell into the hands of the Nazi government, which used them to disarm its political enemies and the Jews. By 1938, the Nazis had deprived Jews of the rights of citizenship and were ratcheting up measures to strip them of their assets—including the means to defend themselves. The horrific consequences have names etched in our consciousness: “The Night of Broken Glass” (Kristallnacht) and the Holocaust. —in a readable but well documented, scholarly manner—of how the Third Reich made use of gun control to disarm and repress its enemies and consolidate its power. The book covers the historical periods of the Weimar Republic and the Third Reich leading up to World War II. The book then presents a panorama of pertinent events during World War II regarding the effects of the disarming policies. As Americans’ right to bear arms becomes increasingly challenged, it is a caution to all who debate these issues. —James B. Jacobs, Warren E. Burger Professor of Law, New York University; author, Can Gun Control Work? Fri., Dec. 20, 2013 Gun Control in the Third Reich is reviewed in The Shooters Log newsletter by Cheaper Than Dirt firearms retailer. Mon., Sep. 23, 2013 New Documentary to Illustrate History of Second Amendment and Current Firearm Policy Debates Research Fellow and author of Gun Control in the Third Reich Stephen Halbrook mentioned on NRA-ILA website.